This is our weekly look at fantasy football adjustments you should make based on venue and/or weather. Entering the weekend action for Week 17 of the NFL season, knowing which players should see an improvement or decline in their projection can be a key to victory. With January just a few days away, it has finally started to feel like winter all across the NFL landscape. The Jaguars, Bears, and Panthers can all count their post-Christmas blessings that they are slated to play in the domes in Houston, Minnesota, and New Orleans, because only two of the 13 outdoor games this week are forecasted to enjoy temperatures north of 50 degrees Fahrenheit. That’s hugely important for the fantasy owners still in action in Week 17 because my research shows that cold weather decreases teams’ reliance on the pass and hurts the success of those attempts when they do make them. I’ve projected venue and weather adjustments for every fantasy-relevant player for Elite subscribers, and I’ll highlight the ones that I find more compelling in the paragraphs below. Aaron Rodgers (+1.3) recaptured his fantasy magic just in time for a lot of owners’ championship games, throwing for 442 yards and 2 touchdowns and running in another two scores at the Jets on Sunday. That one performance erases a lot of the doubt I had built for him this year, but as eager as I am to trust him in my leagues in Week 17, I’m not sure nature wants to cooperate. The forecast for game time in Lambeau is for a temperature in the mid-20s and sustained wind speeds in the mid-teens. Rodgers has scored 2.4 more fantasy points per game at home than on the road over the last five years, and he’s been remarkably immune to cold temperatures, but cold and wind is another animal. There aren’t a ton of games in recent seasons with those extreme conditions, so my projections still expect Rodgers to enjoy a modest fantasy bump for the home start. The most recent similar game I could find — Week 16, 2016 in Chicago — saw Rodgers complete just 19 passes for 252 yards and no touchdowns. I wouldn’t be surprised if he put up similar numbers here, with the team instead relying heavily on their de facto workhorse back, Jamaal Williams (+0.3). The Saints are really the keystone piece to the fantasy weekend. Having already clinched not only a playoff berth but the No. 1 seed in the NFC, the Saints are well-positioned to rest their starters. Those include No. 7 fantasy quarterback Drew Brees (+2.8), No. 4 fantasy running back Alvin Kamara (+0.6), and No. 3 fantasy wide receiver Michael Thomas (+1.2). But head coach Sean Payton has insisted that he plans to treat Sunday’s game the same as any other regular-season game, and if he is true to his word, then the Saints should put up some massive fantasy totals. Brees and the Saints enjoy an outsized home-field advantage, and the benefits of playing in the dome will be magnified this week in comparison to the slate of mostly-freezing games. 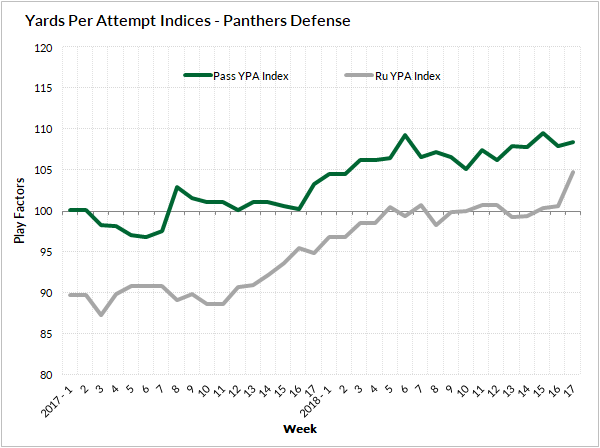 Meanwhile, the Panthers defense had declined consistently over the last two seasons even before they lost Cam Newton’s ball-control offense. Now, they seem likely to hemorrhage both passing and rushing yards to the prolific Saints. I am more willing to trust Kamara and Mark Ingram (+0.6) than Brees and Thomas because of the discrepancy of alternatives the team has at running back and at receiver. The former group has just Dwayne Washington on the bench while the latter is in better shape now than it’s been in weeks following the return from injured reserve of Ted Ginn Jr. (+0.8). The real hope is that Payton continues to show conviction in whatever approach he takes for Sunday because even Washington and backup quarterback Teddy Bridgewater could have fantasy value if it were clear they were going to play the entire game. Late December in Denver feels like the time and place for snow, but with a kickoff temperature of 46 degrees, the Broncos game is forecasted to be the third-warmest outdoor game this weekend. That isn’t exactly balmy, but the widespread really cold conditions make this more moderate temperature a meaningful contextual boost for fantasy players. Broncos’ running back Royce Freeman (+1.5) is poised to be the biggest beneficiary. Phillip Lindsay will miss the game because of his wrist injury, and so the now-eliminated Broncos have every reason to further audition the rookie Freeman with a heavy workload. I expect big things because Freeman has been very efficient on his carries despite limited touches. His 19 Yards Added and 55.9 elusive rating are both fifth among rookies at the position. And he seems as likely as any back to run in a touchdown this week facing a Chargers defense that is better against the pass than the run. 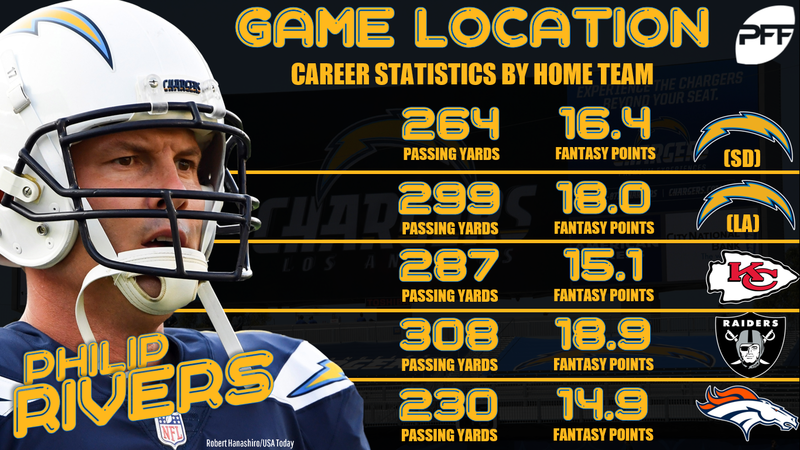 Philip Rivers (-1.3) will no doubt be glad to dodge the extreme weather typical of this time of the year, but this still should be a difficult game for him. Traditionally, he has thrown for and completed fewer attempts for fewer yards and more interceptions in Denver than any other venue in the division. For context, his 14.9 average fantasy points there would have made him 21st at the position last week. Of course, the Broncos’ historically strong defenses likely have as much to do with Rivers’ struggles as the venue itself, but that distinction isn’t critical to make since Denver has continued to play well defensively despite some recent injuries. In particular, the team has allowed just four touchdowns to wide receivers in the four games it has played without its best cover corner, Chris Harris. Keenan Allen (-1.5) was healthy enough to draw 8 targets last week, but don’t expect a vintage fantasy game from him on Sunday. The Colts and Titans decided to kick their playoffs off a week early with a rivalry game that will decide which team makes the actual postseason tournament. After their drubbing of the Titans back in Week 11 and following their 8-1 record over their last nine games, the Colts seemed like the favorite even with the game being played in Nashville. But the NFL’s decision to flex the game into Sunday night may have also flexed it into a rainstorm, which would definitely play to the Titans’ strengths over the Colts’. 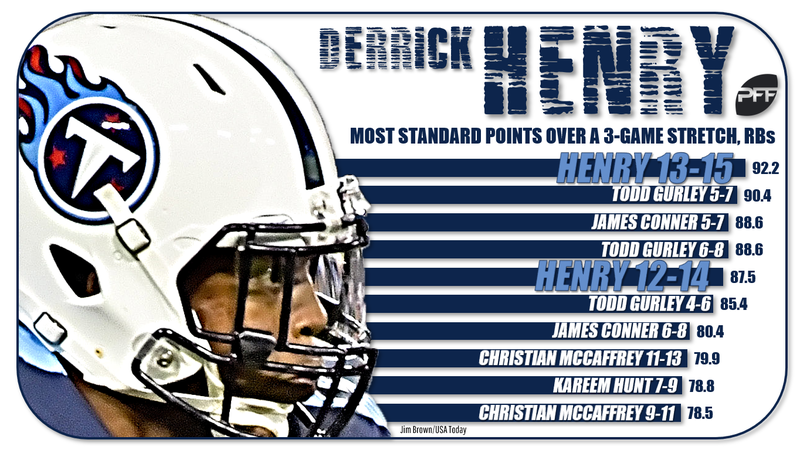 The former starts and stops with Derrick Henry (+0.9), who has finally enjoyed a role as a primary ball-carrier in December and turned that into an average 24 carries, 164 yards, and more than 2 touchdowns per game over his last three games. He was already an RB1 before the weather, and even light rain boosts a team’s run percentage and a back’s yards-per-carry average. He’s the perfect type of player to take advantage of the game context and is a no-brainer fantasy play. The bigger question will be how Andrew Luck (-1.2) and the Colts’ passing game fares in the rain. As a top-five fantasy quarterback on the season, Luck is a difficult player to consider benching, especially since he will clearly be motivated to play unlike some other normally-elite options like Brees, Rivers, and Tom Brady. But Luck’s run of eight straight games with three or more touchdowns has given way to a December with just four touchdowns in four games, and rain and a strong Titans’ pass defense may make it difficult for him to live up to his excellent standard. I’m especially concerned about deep-threat T.Y. Hilton (-0.7), whose fantasy success relies heavily on passing accuracy and sure-footing. You can look elsewhere in daily formats, but in traditional leagues, you’ll probably have to play him and hope he can be a featured part of a Colts’ offense that will likely play more conservatively given the conditions.